Update: There is a message from Mr. Olander, a Senior Monstrologist, and creator of A Field Guide to Monsters in the comments! 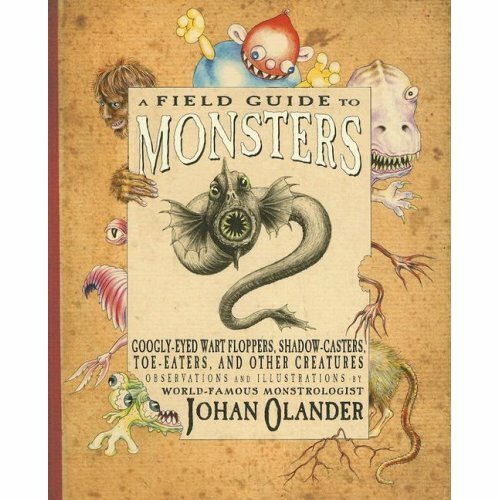 I am reviewing the book A Field Guide to Monsters by Johan Olander. Do you like being frightened? If not, then this is not the book for you. There are a bunch of scary, disgusting, and some downright vicious monsters, like the Toe Eater, in this field guide. The book tells you about all different kinds of monsters you may find anywhere. Each page shows you a picture of a monster, its habits, its diet, its distinguishing features, its life cycle, and safety measures for avoiding that monster. I think this book is cool because it has all of my favorite monsters. The corner cat was one of my favorites because I like cats. This cat, however, is dangerous to humans. It hides in dark corners and waits for a chance to attack. Another cool monster is called the Patootie. Don’t be fooled by its good looks. When you are not looking, the Patootie will eat your stuffed animals. I also like the book because all of the pictures look like they were hand drawn right into the book. Some of the pages look like they have been ripped or spilled on, or the corner is folded. The author’s picture looks like it has been taped on with real tape, but it’s not really real tape. If you happen to see one of these monsters, it would be good to have this book handy because you will know what it likes to do or eat, or if it is dangerous to humans. Maybe Mrs. Mark and Mr. Olander will read and review my book when it is done! I read and appreciated your review on my Field Guide to Monsters. It was he best one I’ve received sofar. Please let me know if you have any monsters where you live…I shall be happy to assist in any way possible if I can. So nice to hear from you. We know researching monsters must keep you very busy. If you ever get to CA for a lecture, we would love to meet you and swap monster notes. We know we have a Drainer, but have not been able to catch a glimpse of him yet. He must be shy. We have had many Balloonsters in the past, but none at the present time. Do you know how we could lure a couch cruncher to our couch? If you lift our cushions, you will find far more than an acceptable level of crumbs and debris. We could use a couch cruncher to gobble up some of the mess. They don’t appear to be a danger to humans, and we are sure we could keep it well fed and happy.